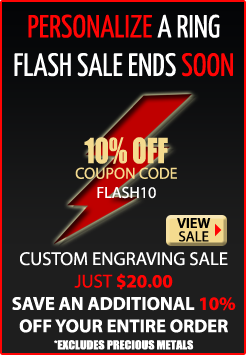 On this page you will find our collection of Personalized Fingerprint Jewelry by category. All of these items are personalized with a fingerprint of your choice. There are several ways to get us your prints to have your item customized. One way to get us your prints is to use an inkpad. You'll want a good amount of contrast or space in between the lines on the fingerprint. Once you take your prints you can use a scanner or high resolution camera and send us the image. You can also select to try your item on first, in which case we will send a return shipper which you can use to send us the prints when sending the item back for engraving or sizing. Here is an interesting way to take your prints if you don't have an inkpad Click here to view video. 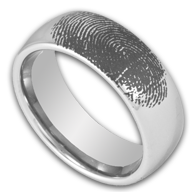 Our collection of personalized fingerprint jewelry can be found here. Whether you are looking for a ring, a bracelet, or a pendant, we have what you need. Available in Tungsten Rings, Titanium Fingerprint Rings, Cobalt Chrome Fingerprint Jewelry, and even our most affordable option Stainless Steel Fingerprint Jewelry. Be sure to message us with any questions and we will be happy to answer them for you. Don't see one of our products you'd like to customize with your fingerprint? Just send us a message and we will let you know if we can customize your desired item directly to your specifications!